BE STILL AND WAIT ON ME. These words are simple and fairly common, but I heard them so loudly that night that I knew they were important. I was struggling that week. I felt God calling me to something I was passionate about that seemed so close to happening, but the door wasn’t opening. I spent hours thinking, praying, and considering how it could work. If this happens, then either I could go this way or that way. Or if this happens, then I could use this to make that…..and so on. The flowchart in my mind was a work of art. Okay, some of it was actually on paper. My mind is pretty quick to go down these paths. I’m slow to act but quick to think it through. God has to be really creative with me to play out a plan I haven’t already considered. And that night after a few days of the door not opening, God said BE STILL. I didn’t feel that what I had been doing and pursuing was wrong. But there was nothing more for me to figure out, and I was exhausting myself and consuming my mind in a way that was no longer productive. And God said Be still. Wait on me. I took this to mean that I needed to be content and be at peace that the door was shut and the timing wasn’t right. And because the voice was so loud and clear, I was still. That night I prayed, left it with God and slept very well. The next morning, I still had a sense that for at least that day, I was going to be still and not let my mind be consumed with figuring things out. I wasn’t going to talk to anyone about more ideas or possibilities or ask anyone for more advice. I played several songs. Here is my favorite “BE STILL PLAYLIST” and some of the particularly meaningful lyrics. Be still, my soul be still. 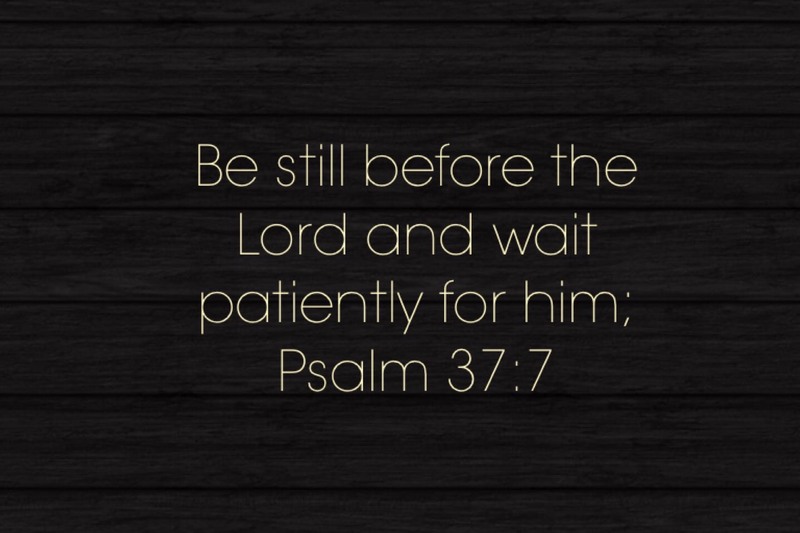 Wait patiently before the Lord. Be still and know that he is God….Be still, oh restless heart of mine. Here before your altar, I am letting go of all I’ve held; Of every motive, every burden, everything that’s of myself. And I just wanna wait on your my God. I just want to dwell in who you are. If I need to be still, give me peace for the moment. It turned out that while I was being still and waiting that day, God had a plan going that I knew nothing about and hadn’t already plotted out. Isn’t that wild? He separately used multiple other people to work on my behalf that day. And I didn’t have to do anything except be still. Over the course of the next several weeks, God worked out his creative plan to do his thing in his way, bringing about greater things for me than I had considered. Being still is hard, but I’m so glad now that I didn’t interfere and mess it up. I believe that God uses my personality of planning and strategizing for his glory and to do his work on many occasions. But other days, he asks me to do something harder, like be still. And in those times, he reminds me that the glory I bring to his name through my strengths pales in comparison to the glory demonstrated through my weaknesses and surrender to him.